Steps to the PERFECT at home PEDI!!! Its the beginning of summer...I don't know about you, but I have been looking at my feet since about March saying I need a pedicure. However, I then say to my self WHEN DO I HAVE THE TIME?!?! So I decided to find some information on our best friend Google and do it one night at home. I know there have to be a few people out there that can relate or use a little relaxation on a Monday night. 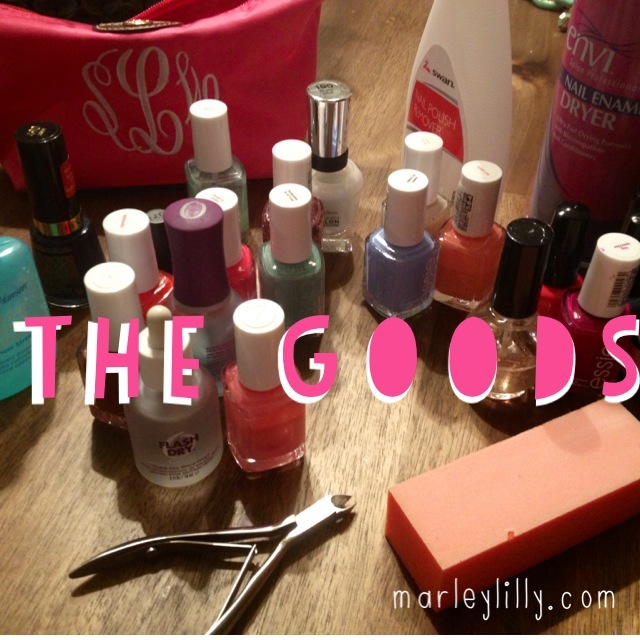 So here is some information I gathered for the Perfect At Home Pedi!! Buff feet when dry, not wet. To really shift dead skin. Use a sturdy foot file and focus on the heels, balls of feet and edges of toes. Fill a bowl with warm water and add a reviving foot soak which helps strengthen and whiten nails. Soak feet for 10 minutes. If you can lay your hands on some marbles, pop them in the bowl and roll your feet back and forth over them for a blissful DIY massage! Massage feet briskly with a foot scrub to get rid of the last dregs of dead skin, then rinse. Gently ease back your cuticles with a cuticle stick. Cut your nails straight across with nail clippers. Make lots of little snips, rather than all at once, or you might break your nail. After clipping, dry off your toenails before you start filing so you don't cause damage. Then, position the file directly under the nail, filing very softly. Choose from one of the two basic shapes—square or soft square—to ensure toenails have a uniform look. Try to avoid overly round shapes because they can sometimes lead to ingrown toenails. Once you’ve filed and clipped, use nail buffers to lightly go over nails. You can buff, polish and shine all in one step to get them nice and smooth. Massage your feet with a rich foot lotion. You’re almost ready to add color, but first, you need to remove the moisturizer as well as any old polish from your toenails to ensure the new coats of color adhere properly. Swipe each toenail with a cotton ball or pad that’s been doused with nail polish remover. Then position a toe separator on each foot to keep your paint job perfect and make it easier to walk around with wet toenails. Apply two even coats of polish, making sure the first is completely dry before applying the second. As for color, Jin Soon says we’ll see lots of oranges, red-oranges, and corals this summer. Now it's just about maintenance! Apply a top coat of polish refresher every other day to keep toes shiny. This product can be a little pricey, but you’ll be amazed at how long your pedicure will last (which saves you time in the long run). Now you know we would be off our rockers if we didn't finish this with a monogram! For those of you that have cute handwriting...they make nail pens for you. Those of you, like me, that like the easy way can use iPhone Button Decals!! At Marley Lilly, you can get 3 for 13.99!! 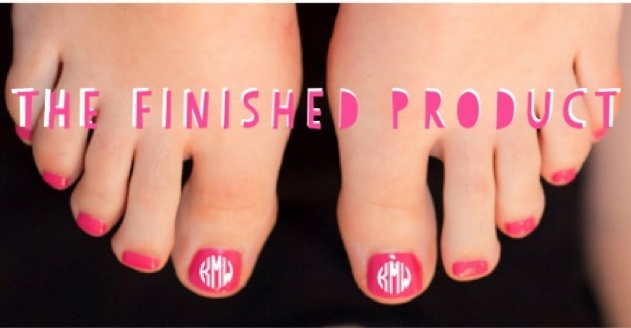 Oh my gosh, love the monogrammed toes! Why didn't I think of that?! So cute!